Illustrators, have you ever wanted to alter a picture after it was published? I know I have - too many times - but I've always stopped myself before going through with it. Howard Pyle never stopped himself, though, particularly when he had good reasons to change something. Historical accuracy was one. Take "The Burial of Braddock" from Woodrow Wilson's George Washington. Here it is as it appeared in Harper's Monthly for March 1896 and in the book version published later that year. Now, in reviewing the book, writer and historian Paul Leicester Ford criticized some of the details in the illustrations. Pyle heard about this in late April 1897, just when most of the original oil paintings were about to be purchased and presented to the Boston Public Library. No doubt chagrined, but "anxious to make them as accurate as possible," Pyle asked Ford for advice on how to correct them, "especially as my pictures are now, as it were, to go upon record." 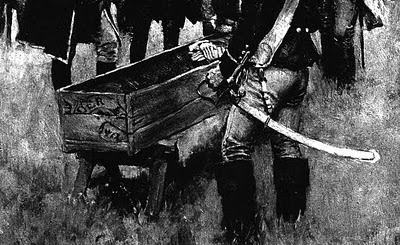 In his review, Ford had said of the burial scene: "Common sense should have informed the artist that there was no time to get or make a coffin for Braddock, if the account had not specifically stated that he was wrapped in a standard." Apparently, Ford reiterated this point in his answer to Pyle. "I had overlooked the fact that Braddock was wrapped in a standard," Pyle admitted, "but I disagree with you that the body would have been buried uncased or uncoffined." 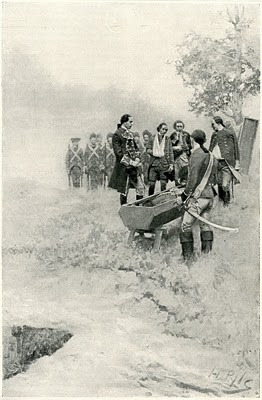 As Braddock had died at 10 p.m. and was buried at dawn, Pyle reasoned that "in the interim...some rude case would have been constructed to contain the remains. This is what I have tried to represent, and not a well constructed and well finished coffin." And while Pyle agreed that Braddock's uniform and boot-toes should be hidden by a flag, he told Ford, "I shall probably allow the roughly made box to remain, unless you, in your kindness, will suggest some further detail to indicate that I was in error." Evidently, Ford indeed suggested that the "rough box" should be rougher still, for Pyle replaced it with one built from a broken up crate - as can be seen in the painting now "upon record" in Boston. 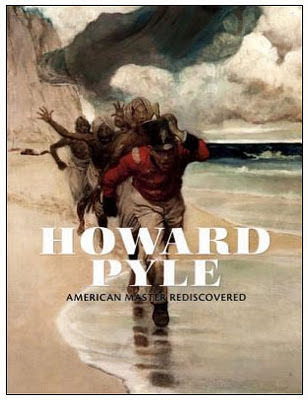 On This Day in Howard Pyle History?